I believe we have the largest athletics budget in the Sun Belt. The schools with smaller budgets are doing more than us. I'm all about having more money, but we should focus on having the right personnel to properly funnel that dough. I normally fill out all of these surveys as it's an opportunity to give the AD direct feedback that they hopefully use to make improvements. However, after seeing that this is just another survey regarding sponsors, I didn't bother. Who the sponsors are and my decision to support those businesses couldn't be any further down the list of what's important to me. These surveys seem so tone-deaf. Last edited by Voltronjacko on Tue Jun 12, 2018 11:14 am, edited 1 time in total. 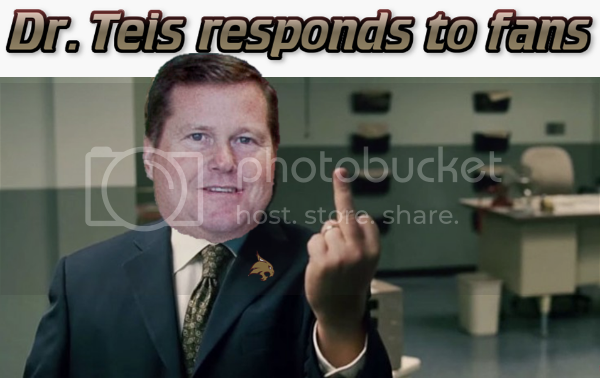 The last question in the survey is "Please provide us with any additional feedback, comments or concerns regarding Texas State Athletics." Perhaps it is my conspiracy theory mind going, but I don't think they are tone deaf. They already know the many shortcomings of the AD, so why bother asking? They then decide to frame questions to get them the answers they want. If this survey comes back and reflects the population of Bobcat fans being more likely to spend money on a sponsor, they can use that to get more sponsors. Then Larry looks like he's being successful, and therefore deserves a raise. Wins? Who cares about wins when people still donate and attend? Who cares about the gameday atmosphere if people still show up? I made judicious use of every opportunity to respond with "other" and fill in a few choice comments. Many of them are along the lines of "why would I choose to support a sponsor that clearly has bad judgment in determining our athletic department administration is a wise investment partner?" Whether a company sponsors TxSt athletics has absolutely no bearing on my purchasing choices. My purchasing choices are based on local ownership and whether or not they provide quality goods & services. Maybe Dell AMD IBM 3M or Wholefoods would move into San Marcos vicinity to save money on office space. I feel like Wholefoods could be a huge get for us with the Amazon deal. I could just see it now: Jim Wacker field at Amazon Stadium!! No, that will never happen. Though in theory seems like it would be a great thing!